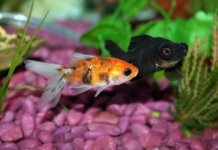 Although aquaponics has been around since ancient times, aquaponic fish tanks are a fairly recent trend that has taken over the hobby by storm – and it’s no surprise. It offers a fun and innovative approach to fishkeeping – and helps save time on water changes and maintenance to boot. In this article, we reveal our top 5 coolest aquaponic fish tanks on the market. 3-gallon tank. Comes with plant pods so you can easily plant seeds above the tank. Suitable for a Betta fish. Herbs included. 1.4-gallon tank. 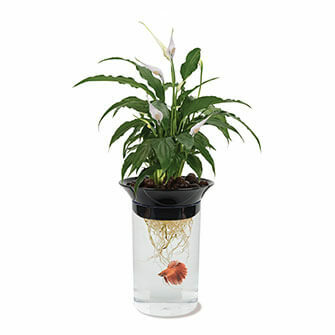 Comes with a plastic plant container above the tank. Tank not included. 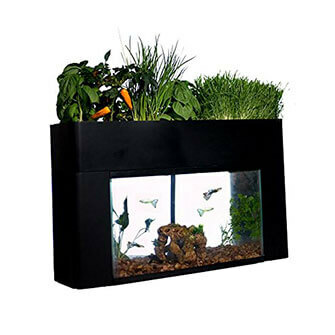 The planter and tank frame are suitable for a 10-gallon tank. Pump, timer, light bar and clay included. 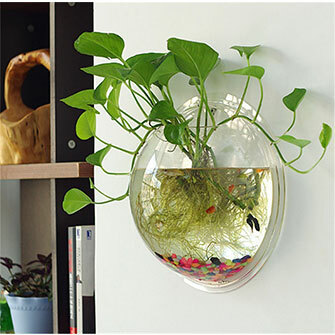 Hanging wall decoration aquaponic fish tank. Suitable for a gallon of water. Made of clear acrylic. Simple design. Easy to set up and maintain. Tank not included. The garden works best with a tank of 10 gallons. Oregano seeds, basil and tube light included. Simple to maintain. The top performers in our review are Back To The Roots aquaponic fish tank kit, the Penn Plax aquaponic fish tank, and the AquaSprouts garden. Before getting into a more detailed review of our top 5 products, it’s important to understand what aquaponics is and what to look out for when buying an aquaponic fish tank. The term “aquaponics” is a portmanteau for aquaculture and hydroponics. While aquaculture refers to keeping fish and other aquatic animals in tanks, hydroponics refers to the cultivation of plants in water without soil. Aquaponics combines these two aspects. In turn, the fish and plants live in a co-existing environment where they both provide for each other. Having such a system can make an aquarium nearly self-sufficient. What are the benefits of an aquaponics fish tank? Most fish tanks demand regular water changes and maintenance; all fish produce waste, which over time dissolves and becomes toxic to them. Although toxic to fish, these elements are also vital for plant growth – which is where aquaponics kicks in. The waste is recycled and used as fertilizer for the plants. The plants use the nutrients to grow, while acting as a mini-filter which keeps the water healthy; this is why some aquaponic fish tanks claim to be fully self-sufficient. In order for this process to be successful, fish, plants and beneficial bacteria must be present. Before buying an aquaponics fish tank, it’s important to define your goals. Are you looking for a fun decoration or a legitimate way to grow a large amount of plants? Or are you perhaps trying to replace your fish tank filter with a low-upkeep solution? Many aquaponics aquariums in this review are incredible decorations and a very fun way to get into the hobby. Unfortunately, the plants in an aquaponic system can’t adequately replace a canister filter and it’s not an ideal solution if you want to keep a lot of demanding fish. Solitary fish like the Betta are a perfect choice on the other hand, as they’re fairly resilient and non-demanding. If you’re looking for something simple, we recommend starting with an aquaponics fish tank kit because they’re convenient, not too expensive and come with everything you need to get started. If you’d like something more complex – a planting station is a better choice. 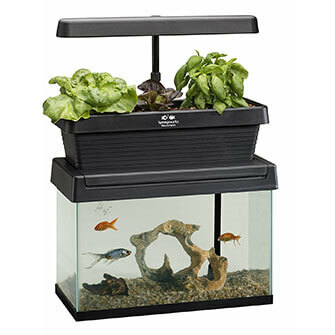 Planting stations often don’t come with a fish tank, but will allow you to grow more plants and give you more options when it comes to space or additional equipment. If this isn’t your first field trip into aquaponics, you’ve definitely heard about Back To The Roots water garden. It’s one of the most popular (and arguably the best looking) products on the market today – but how is it in practice? Back to The Roots offers a total of 3 gallons of space, which is plenty for a Betta fish, and can even house some more demanding fish. There’s a total of 6 pods where you’ll be able to plant and harvest herbs and leafy greens. This product is advertised as fully self-sufficient, requiring little to no maintenance at all; we found that this is, for the most part, correct. When planted, the pods offer adequate filtration, while just a single Betta will provide enough nutrients for your plants. Although its design may look simple and minimalistic, it’s a fairly advanced system which offers the best of both worlds – fishkeeping and organically grown food. In order to give you a great start to this endeavor, the kit also comes with organic seeds that you can plant. Although fairly tiny and not suitable for anything else than a Betta, this aquaponic fish tank is a very well-designed product and has earned its spot as our #2 pick. The total capacity of this mini-garden is 1.4 gallons, and it measures about 10 inches in height, and around 8 inches in diameter. Its compact, oval shape makes it a nice addition for your office or study desk, and it blends well into the surroundings of any room you place it in. It has a plastic plant container above the water and it comes with ceramic substrate planting stones. With these, you can grow most leafy greens, herbs and even house plants. Regardless of which plant you choose to grow, the aquaponic system will cultivate it for you. Just make sure that the plant isn’t toxic for your fish – especially since your Betta may try to nibble on your plant’s roots. Another feature we loved about the Penn Plax aquaponic fish tank is that we found it very easy to maintain. The planter comes off easily – ensuring easy access when you need to clean your tank or perform water changes. If our first two picks are too small for your needs, the AquaSprouds garden is one of the largest systems in our review. Although it may be a bit too pricey for a simple gift, we found that it’s worth every penny if you’re serious about aquaponics. The garden is suitable for a 10 gallon fish tank. It’s important to note that the tank itself isn’t included – it’s up to you to do the research and find a good match. This tiny garden will match most 10-gallon setups. A pump and timer. The pump’s flow rate is 160 gallons per hour and it includes a timer which you can adjust to intervals of 15 minutes. A light bar. In our opinion, this is the most convenient feature of the tank. The bar is located above the tank’s planter and enables you to install lighting necessary for the plants that you want to grow. Clay grow media for your plants. A great instruction booklet to help you get set up. Overall, this may be the most comprehensive aquaponics system in this review – its only downside being the lack of the actual fish tank. 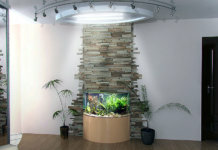 A rather interesting take on aquaponic fish tank ideas and a great conversation piece. 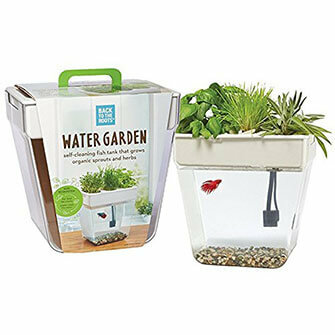 With the capacity of 1 gallon, it’s a cozy home for tiny fish and some plants, although it won’t leave much space when it comes to your selection. A Betta fish is perhaps the only common species you’ll find that can thrive in the 1-gallon environment. On the upside, it has a very sturdy acrylic construction, and is a beautiful decor element to add to any room if you don’t have space for a regular tank. Due to its simple design, we also found it easy to set up and maintain. If you like unconventional fish tanks and want to try something different, we recommend trying Sweetsea’s hanging bowl fish tank. Made in the USA and an overall solid choice if you’d like a larger aquaponics system, the Springworks Microfarm is suitable for most 10-gallon fish tanks. Similarly to the AquaSprouts garden, a fish tank isn’t included. It does, however, come with oregano seeds and basil, as well as a tube light for your plants. Once you pick out your 10-gallon tank and place the Microfarm above it, it should take only a matter of days for the aquaponic system to produce results. The fish you opt for will help your seeds grow faster and the plants you gain will provide clean and healthy water. The biggest asset of this tank is, by far, its ease of maintenance. We found that it’s self-sufficient, requiring little to no involvement on our end.